Nourishes heart blood, cools blood heat, nourishes heart yin, calms shen or spirit. Nourish blood, strengthen heart, tonify Qi. This formula is very useful for disturbed when patterns due to deficiency, and their effect is equal to Tian Wan Bu Xin Dan. The herbs work together to calm the heart by tonifying Yin and blood while also cooling the blood. Biota, the main ingredient is valued for promoting sleep and calming anxiety. If you are experiencing the feelings of nervousness and low energy, the natural dietary supplement Sedalyn Extract is the product for you. Sedalyn extract works naturally to perk and energize the whole body. Use for disturbed shen due to deficiency of heart blood causing insomnia, restlessness, palpitation, night sweat, anxiety, or vivid uncomfortable dreaming. 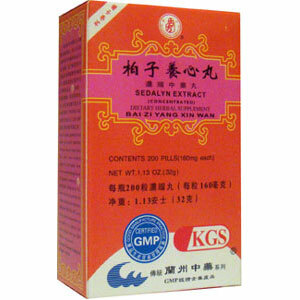 Also useful for poor concentration, clouded mind, short breath, and mental fatigue. Low energy, chills, cold limbs, headache, dizziness, poor memory, agitation, nightmare, a pale face, neurasthenia with the above mentioned symptoms. Take 8 pills, 3 times a day.